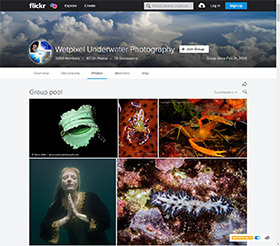 The Underwater Photographer of the Year (UPY) contest is making a final call for entries. It offers categories for international entries in 5 categories, which include: Wide Angle, Macro, Wrecks, Behavior, Up & Coming. In addition, there are 3 categories for images shot in the UK: British Waters Wide Angle, Macro and Compacts. The deadline for entries is 4 January. The January/February edition of Underwater Photography magazine is now available to download. It features an article on Fluorescence diving by Lynn Miner and an interview with Burt Jones and Maurine Shimlock. Nigel Marsh and Helen Rose discuss Anilao, while Wade Hughes’s stunning images form a backdrop to his article about sperm whales in the Azores. There are equipment reviews by Erin Quigley, Phil Rudin and Jussi Hokkanen, while Fernando Lessa talks about the Atlantic Forest of Brazil. Wishing the Wetpixel community the very happiest and festive of (Gregorian) New Year celebrations. May 2016 bring you truly memorable imaging opportunities, safe and enjoyable diving, travel to exotic locations and plenty of time with those whose company you enjoy. All the very best for 2016. Tokina has announced a new APS-C rectilinear wide angle zoom lens. The 14-20 F2 Pro DX offer a maximum aperture of f2 at all focal lengths, internal focusing and a minimum focus distance of 0,28m. Quite how this will work behind a dome port remains to be seen but if it works, it is an interesting alternative. On Christmas Eve a giant squid, Architeuthis dux, ventured into Japan’s Toyama Bay and swam beneath a pier full of observers. The 12-foot long squid stayed in the bay for several hours, giving diver Akinobu Kimura the chance to suit up and film the elusive creature underwater. Wetpixel Editor Adam Hanlon provides some guidance and critical steps for those fortunate enough to have received new camera and housing systems over the holiday period. Whilst new normally means waterproof, there are few checks and set up steps that are worth performing before the system gets used for its first real dive. Researchers have discovered a new species of lanternshark. Etmopterus benchleyi or the ninja lanternshark has been described in a paper (pdf) published in the Journal of the Ocean Science Foundation. It is found at great depths in the central eastern Pacific, and have tiny bioluminescent dots all over their bodies.